Beetles are destructive pests to the home garden. Crabapple trees are a highly susceptible host to beetle attack. Familiarize yourself with what to look for as well as reliable control methods to manage insect infestation. Provide your crabapple trees with proper care for vigorous plants ready to fight beetle invasion. Adult Japanese beetles feed in groups. Their bodies are metallic green in color with copper-hued wings, according to the University of Kentucky Cooperative Extension Service. White hair protrudes from beneath each wing. Measuring 7/16 inch in length, Japanese beetles make their appearance in the garden during June and remain for up to six weeks. Japanese beetles seek out over 300 different species of host plants. The most commonly attacked plants include, but are not limited to, flowering crabapples (Malus species), Japanese maples (Acer palmatum), stone fruit trees (Prunus species) and American elms (Ulmus Americana). 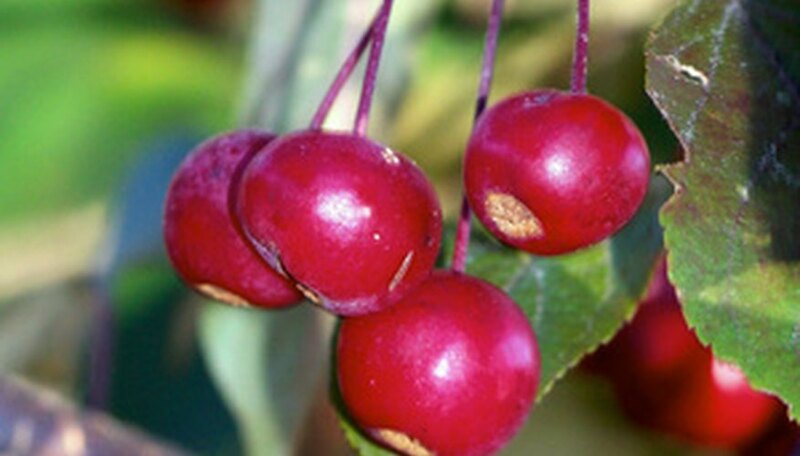 Of the attacked plants, crabapples often suffer severe problems along with Japanese maples, according to the University of Kentucky Cooperative Extension System. Keep in mind when planting crabapples that adding these other plants to your garden increases vulnerability to beetle infestation. Control of beetles on crabapple trees is necessary because of the extensive damage that often occurs. Look for the presence of groups of Japanese beetles on foliage and flowers. Damage may begin on the top of a plant and descend toward the bottom; look for skeletonized leaves which are leaves that are missing plant tissue with veins still intact. Your tree may also appear to have been scorched, or burned with fire, according to the University of Kentucky Cooperative Extension Service. Trees may suffer from diminished health and severe loss of blooms and foliage. For natural control of beetles on crabapple trees, smaller populations are removable by hand. One beetle causes the appearance of even more beetles, so removing them may cause the infestation to taper off, according to the University of Kentucky Cooperative Extension System. A suggested method is shaking them from the branch during morning hours. Beetles are slow-moving during the morning and will fall without challenge into a container full of a water and soap solution where they will die. For chemical control, particularly during extreme infestations, applications of insecticides provide effective management. For plant-based control, apply neem oil products that provide up to four days of control. For pyrethroid insecticides, choose a chemical with the active ingredient cyfluthrin, befenthrin, permethrin or other insecticides labeled for Japanese beetle control on crabapple trees. These chemicals offer control for up to three weeks, according to the University of Kentucky Cooperative Extension Service.